I have been involved with different kinds of hatha-yoga and bodywork techniques for many years and have been teaching my own particular approach in yoga classes in London as Yoga from Within for the last 17 years. My work as a yoga teacher is inspired by the wish to integrate the yoga ideals of individual transformation into our everyday life, work and relationships. My main focus in teaching is how we can be creative with our thinking and leave behind old patterns that no longer serve us, to make space for new possibilities. Through yoga we can heal our thinking just as we can heal the body. 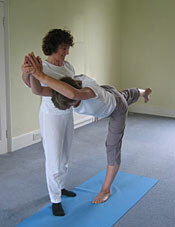 We can also develop more sensitivity by understanding and working with the poses as a form of artistic expression. As well as my years of yoga classes in North London , my yoga teaching has also taken me to a variety of spaces and places such as colleges of further education, a drama school, a young offenders' prison, business centres, hospitals and a residential mental health community. Complementary to my yoga teaching is my continuing study of the philosophy of yoga, (which includes my translating several books of spiritual teacher Heinz Grill from the original German). (see books) and my recent work with sculpture (see art).